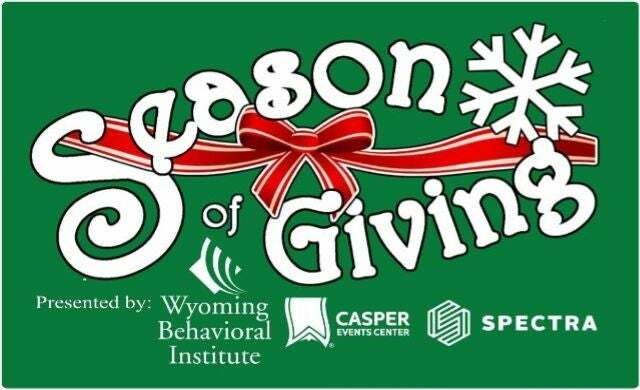 Spectra, providers of Venue Management, Food Services & Hospitality, and Partnerships at the Casper Events Center, is very excited to announce the return of the SEASON OF GIVING presented by Wyoming Behavioral Institute. From December 3–December 20, Spectra’s focus will be towards a season of giving, sharing, and promoting social good. Each event will highlight amazing people, charities, and causes with the goal of generating fundraising dollars, raising awareness, and spreading holiday cheer in the Casper Community. Starting Monday, December 3, we will be collecting cash, non-perishable food, household and clothing items to be donated to Mimi’s House and the Wyoming Food for Thought Project. Donations can be left at the SinclairTix Box Office at the Casper Events Center through Thursday, December 20th or brought to any upcoming event, including all Season of Giving events. Mon, Dec 17 *Oak Ridge Boys "Shine the Light on Christmas"
*Bring a donation item to the Moscow Ballet’s Great Russian Nutcracker on Wednesday, December 5th or to the Oak Ridge Boys “Shine the Light on Christmas” concert on Monday, December 17th and get a FREE POPCORN from the Casper Events Center concession stand. Donations must be turned-in to the SinclairTix Box Office at the Casper Events Center to receive free popcorn voucher. $1 per ticket sold to the Gruner Brothers Booze & Bacon Festival on Saturday, December 8th will be donated to the Wyoming Food for Thought Project. A list of donation suggestions can be found at the bottom of the page. Along with all of these events, the Spectra team at the Casper Events Center will "Adopt a Family" and provide assistance and gifts to a family in need this holiday season. Spectra Venue Management would like to thank Wyoming Behavioral Institute, Reliant Federal Credit Union, the Ramkota Hotel and Conference Center the Kiwanis Club of Casper, Shawn “DJ Nyke” Jackson, Rocky Mountain Sound and Lights, and Wyoming Amusements for their support of the 2018 Season of Giving. Breakfast with Santa, sponsored by Reliant Federal Credit Union, will be held in the Summit Room on Saturday, December 15 from 9 am to 11 am. Breakfast will be prepared by the Kiwanis Club of Casper. Santa will be on-site to visit with the kids and get a photo. There will also be coloring and Christmas cookie decorating! Breakfast and activities are free but there will be a $1 per person registration fee. All registration fees will be donated to this year’s selected organizations. Attendees that bring donations for the Food, Fund and Household & Clothing Drive will be entered to win a door prize! Registration begins Tues, December 4th. NOTE: Registration is required; Limit 200 participants. $1 per person registration fee required. Registration fees will be donated to the Wyoming Food for Thought Project and Mimi's House. Photos with Santa will be posted to the Casper Events Center's Facebook page after the event. The Big Ticket Giveaway, courtesy of the Ramkota Hotel and Conference Center, is a contest that ends December 2. Enter to win Two Tickets and a Reserved Parking Spot for EVERY EVENT in 2019! The winner of the contest will be announced at a press conference on Wednesday, December 19. Teen Night is Wednesday, December 19 from 6:00 pm to 10:00 pm. This night of FUN is open to teens ages 13 and up. DJ Nyke will be our emcee and music will be provided by Rocky Mountain Sound and Lights. Activities will include Basketball, Music, Dancing, Pool Tables, Corn Hole, Table Tennis, and Giant Jenga. Thanks to Wyoming Amusements for providing many of the activities and games! Concessions will be available. A portion of the concession sales will benefit Mimi’s House and the Wyoming Food for Thought Project. Attendees that bring donations for the Food, Fund and Household & Clothing Drive will be entered to win a door prize! Parents and guardians are welcome to chaperone their teens. Family Game Night is Thursday, December 20 from 6:00 pm to 10:00 pm. Gather-up the family and join us for a night of games, dancing and fun! DJ Nyke will be our emcee and music will be provided by Rocky Mountain Sound and Lights. Activities will include Games, Basketball, Music, Dancing, Pool Tables, Corn Hole, Table Tennis, and Giant Jenga. Thanks to Wyoming Amusements for providing many of the activities and games! Admission is free to all! Concessions and cash bar will be available. A portion of the concession and bar sales will benefit Mimi’s House and the Wyoming Food for Thought Project. Attendees that bring donations for the Food, Fund and Household & Clothing Drive will be entered to win a door prize!